It was a fairly slow week on the tournament front, but there was still quite a bit of action taking place, and a lot of major tournaments coming up to discuss. So without any further delay here is a look at the tournament results over the past week. The biggest tournament of the week was the PokerStars EPT Madrid Main Event, and with most of the big names in poker in attendance the EPT Madrid proved to be a barn-burner of an event. When all was said and done it was Danish poker pro Frederik Jensen who came through with his first major tournament victory after cutting a 3-way deal with Fraser McIntyre and Andrei Stonescu at the final table. For a complete look at the EPT Madrid final table you can read our report HERE. Poker pro Isaac Baron came out on top of a very tough final table at the $5,000 buy-in Wynn Classic Main Event. Baron had to outlast some of the game’s best players including Andrew “luckychewy” Lichtenberger and Tyler Reiman at the final table. The PokerStars UKIPT is heading to Nottingham and the Dusk Till Dawn poker room, and for the first timed the popular UK poker tour is offering a massive $1 million guarantee for the UKIPT Nottingham Main Event! The tournament is scheduled for April 11-16, 2012. Last year the tournament attracted about 700 players, and to reach the $1 million guarantee that number will have to increase by over 50%; in order to boost the rolls the UKIPT has added a third starting day to the tournament. In a remarkable occurrence, there was a Sunday Million final tabled full of relatively unknown players and there was no deal cut! The outright win went to a player using the PokerStars handle “SpeckBasu” who walked away with an impressive $231,214. 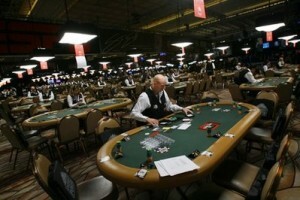 This entry was posted on Tuesday, March 20th, 2012 at 11:03 am and is filed under Poker News. You can follow any responses to this entry through the RSS 2.0 feed. You can leave a response, or trackback from your own site.